Multiple options for a variety of coupling situations Prototyping and laboratory operations utilize many sizes of plastic tubing and a variety of coupling combinations. A quick, convenient method of determining the best coupling for prototyping or lab work is to have an assortment of Quick Couplings in a variety of flow sizes and end connections. OMEGA offers two kits: A handy assortment in acetal for general purpose use (the Lab Pak) or polypropylene couplings for greater chemical resistance (the Chem Pak). 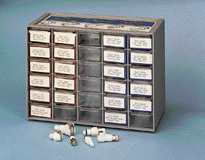 The Lab Pak and the Chem Pak are sold in attractive multi-drawer cabinets for easy identification and storage. Lab Pak and Lab Pak Plus. Delrin acetal general purpose quick couplings for most applications. Fits 1/16 " through 3/8 " tubing. Chem Pak and Chem Pak Plus. Polypropylene chemical resistance for applications exposed to acids and caustic environments. Excellent for chemical laboratories. Fits 1/16 " through 3/8 " tubing. 참고: Comes with complete operator's manual. Caution: Always install OMEGA ® shutoff valves with flow entering the valve from the “body” side, see illustrated example on PDF.